Reproduced from the Official 1937 Civilian Conservation Corps Annual, Nebraska - South Dakota District, Seventh Corps Area. Annual was donated to the CCC Museum of South Dakota by Melvin Hermanson. The history of any organization is a record of its leaders. Events occur but men shape events from the matrix of problems and situations as they arise. The story of the Nebraska-South Dakota District CCC, is no exception to these general rules of human history; it is a story of many men who have given of their best efforts for the general welfare and good of the CCC, a story that while being lived has been characterized by dramatic intensity and action. The CCC was a new idea four years ago; today it is an accomplished reality, colorful and stimulating. 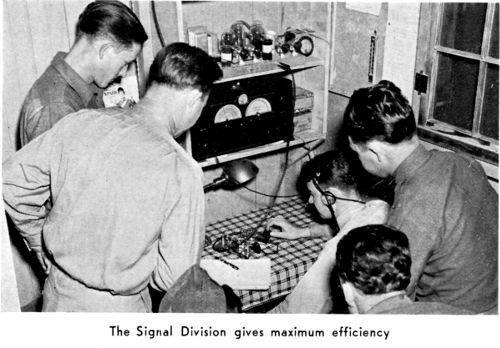 The Nebraska-South Dakota District CCC, was organized on February 1, 1936, through a consolidation of the Nebraska District with the South Dakota District. The Nebraska District was organized in April, 1933, with Headquarters at Fort Robinson, Nebraska. Two sub-districts were designated: that of Southeastern Nebraska, with headquarters at Fort Crook, and the Northwestern Nebraska sub-district, with headquarters at Fort Robinson, Nebraska. Major Edwin N. Hardy, Cavalry, Post Commander at Fort Robinson, also commanded the Nebraska District CCC, at its inception. On April 1, 1934, the District Headquarters was moved to Fort Crook, Nebraska, and the District was placed under the command of Colonel T. M. Anderson, 17th Infantry. On November 15, 1934, Colonel S.J. Sutherland, 17th Infantry, assumed command of Fort Crook, Nebraska, and the Nebraska District CCC. Colonel Sutherland remained in command until relieved by Colonel Clyde R. Abraham, 17th Infantry, on October, 1936. On April 16, 1937, District Headquarters was moved to the Quartermaster Depot at 22nd and Hickory Streets, Omaha, Nebraska. Major Chauncey H. Hayden, 17th Infantry, assumed command at the new headquarters, and is the present District Commander. Major Hayden had previously been assigned as District Executive during the period September 23, 1936, to April 16, 1937. The first selectees to be processed in the Nebraska District arrived at Fort Crook, Nebraska, on April 26, 1933. Thirteen companies were organized at Fort Crook during the next month and most of them were sent to the West Coast. Only seven companies were retained in Nebraska until the fall of 1934. At this time all Nebraska companies were returned to Nebraska. At present there are eighteen projects being carried on in Nebraska: Bureau of Reclamation, 2; State Park, 2; Forestry, 1; Biological Survey, 1; and Soil Conservation Service, 12. 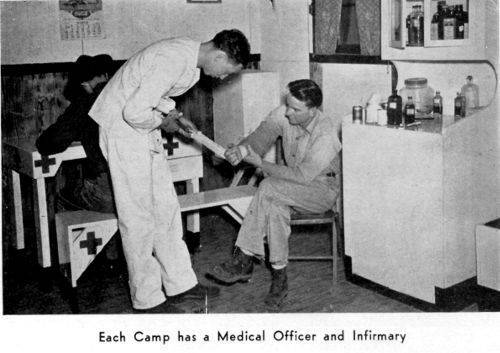 The history of the South Dakota District CCC, has its beginning at Fort Meade, South Dakota. Fort Meade is located in the extreme mid-western part of the State of South Dakota in the Black Hills region. The Fourth U. S. Cavalry is stationed at Fort Meade and at the time of the inception of the CCC was under the command of Colonel O. W. Rethorst, Cavalry. Two Sub-District Headquarters were organized for the companies in the Black Hills National Forest and the Harney National Forest; the camps in the Black Hills National Forest were managed by the Sub-District Headquarters at Deadwood, South Dakota, while the companies in the Harney National Forest were managed by the Sub-District Headquarters at Custer, South Dakota. In August, 1933, reorganization took place abolishing these Sub-District Headquarters and all companies thereafter operated under the jurisdiction of Fort Meade. At this time Colonel Rethorst was succeeded by Colonel W. R. Pope, Cavalry. Colonel R. M. Beck, Jr., Cavalry, relieved Colonel Pope in August, 1935. On February 1, 1936, Colonel S. J. Sutherland assumed command, due to the consolidation with the Nebraska District CCC. 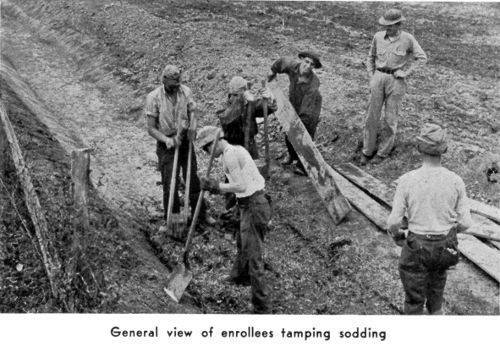 The initial increment of selectees for enrollment in the CCC, consisting of ninety-four (94) men, arrived at Fort Meade on April 29, 1933. Between this date and July 5, 1933, a total of 1,700 men, which includes juniors, veterans and LEM, were enrolled and conditioned at Fort Meade, South Dakota. 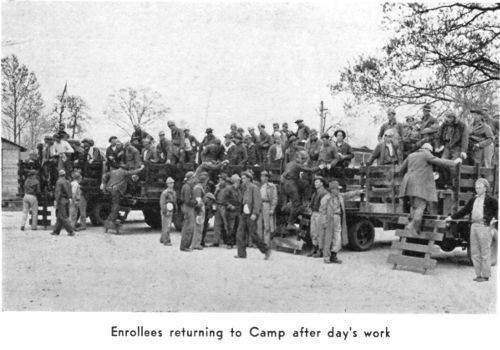 On May 18, 1933, Company 789 was organized and left Fort Meade for the work project. This company is still in existence and has the distinction of being the oldest company in the Black Hills. By June 19, all companies had been organized and had departed from Fort Meade for station at forest projects in the hills. In June and July, 1934, during the drought period, fifteen additional companies were organized using men of companies already in existence as cadres. The greatest number of CCC companies at one time situated within the State of South Dakota was thirty-three. In the Fall of 1935, fifteen companies were demobilized and several transferred without the District. At present twenty-three companies are located in South Dakota with an authorized strength of 3,800. Companies were employed on the following types of projects: forest, state park, reclamation, soil conservation, biological survey, and national park. The importance of supply in the CCC cannot be over-estimated. In order to perform the number of functions necessary to the operation and maintenance of camps, the Quartermaster exists as the great business factor of the District. Not only is he responsible for procuring supplies, but he is charged with maintaining them. Every officer and member of the CCC is obligated to the Quartermaster and responsible to his office for some government property. The Quartermaster gives the enrollee three square meals a day, sends him to work in suitable clothing, supplies the soap with which he bathes, taps his shoes, heats his barracks, and sends him to bed at night in clean sheets and warm blankets on a comfortable bed. He is the librarian, carpenter, plumber, electrician, surveyor, engineer, fireman, bookkeeper, chauffeur, mechanic, train conductor, station master, iceman, milkman and, if occasion arises, the undertaker. During the first year of activity in the Nebraska District, a small detachment of enrollees, supplemented by a detachment of Army personnel performed the duties usually performed by a Headquarters Company. On April 1, 1934, District Headquarters Company was organized at Fort Crook, Nebraska, and functioned until July 29, 1937. On this date the Headquarters Company disbanded and the work was turned over to a staff of civilian personnel who are at present performing administrative duties at District Headquarters. Swimming and life saving schools were conducted during the late spring of 1936 and 1937. Specially selected enrollees from all the companies in the District were given Red Cross training in swimming and life saving. 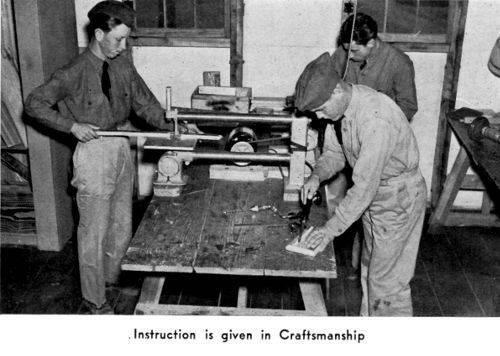 A cooks' and bakers' school for officers and enrollees was conducted in the early spring of 1936 at Fort Crook, Nebraska. All officers in the work companies and all enrollee cooks and mess stewards were required to attend. The objective of the school was to train the officers and selected enrollees in the theory and practice of cooking, to secure the maximum benefit from the ration through its intelligent utilization by properly trained personnel, and to develop the novice in a short period so that he would understand the basic principles of culinary art. 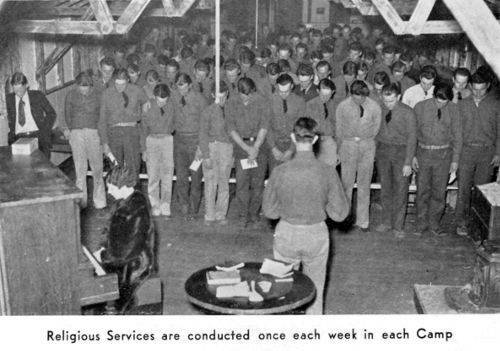 From the beginning the Chaplains have played a very important part in maintenance of the morale and welfare of the thousands of young men of the camps. Sturdy men of God, the chaplains have gone into the camps bringing the gospel into these outposts of civilization, infusing new hope and high character into youths who might well have grown careless of faith were they left to drift unguided by spiritual counsel. The kindly voice and deep Christian philosophy of the Chaplains of the CCC will always remain a part of the best traditions of the Nebraska-South Dakota District CCC. 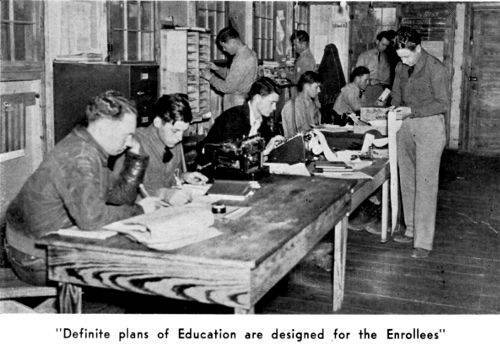 When the Educational Advisers were first placed in the CCC camps in the spring of 1934, the educational policies and objectives were contained in a Handbook for the Educational Adviser. This handbook was prepared by the United States Office of Education and approved by the War Department. This was later supplemented by Mr. Oxley's Ladder of Achievement, setting forth specific objectives for enrollee training. Since the principles contained in these two documents have been the measuring stick for building a progressive and efficient educational program. The Educational Advisers of this District are selected with the most rigid attention through their personal qualifications, the absolute minimum qualifications being the possession of a Bachelor's Degree from a recognized college or university. Habits of research and scholarship are deemed necessary for the growth and expansion of the educational program so that it may give the enrollee the best possible training. In order to further the training of advisers, conferences are held regularly and schools conducted for them. 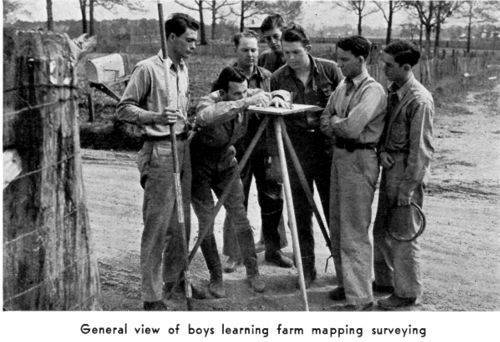 The CCC problem is distinctly different from that of the public schools and the advisers must be trained in the techniques that will apply to camp conditions and CCC educational objectives. 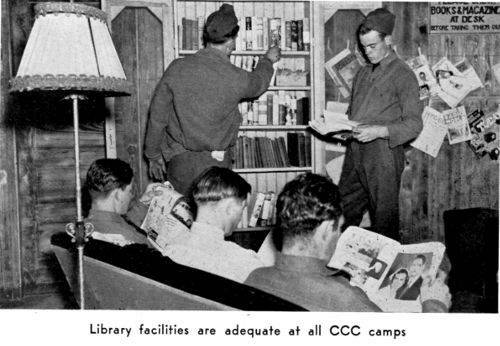 The basic principle of the entire CCC program is good citizenship and our facilities must be used to make the men more employable when they return to civilian life for honorable employment is a stabilizer of character and a requisite of good citizenship. The advisers' work in the camps is manifold. Inasmuch as participation in the camp schools is voluntary it is plainly evident that in addition to scholastic training the adviser must possess real leadership personality. Without this quality scholarship will avail him little in his contact with the enrollees. The position of the camp educational adviser is not a sinecure. 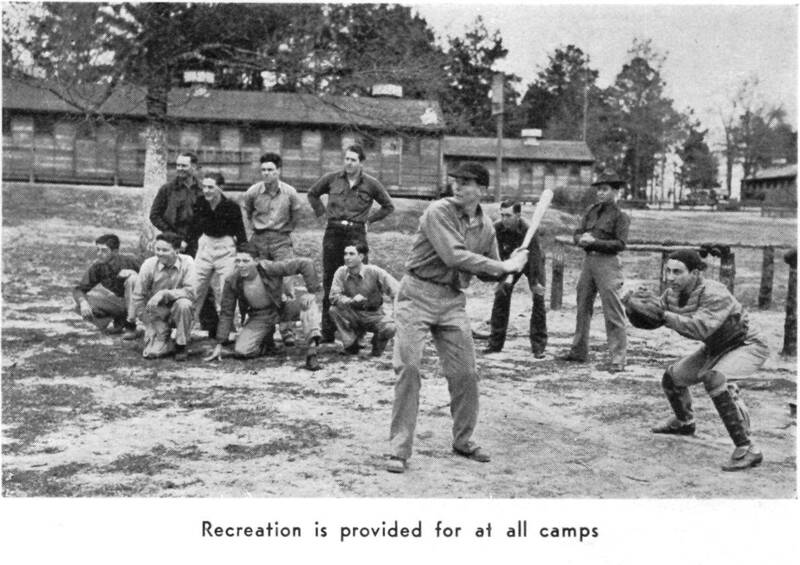 It demands highly trained men: men who have vision of the challenge to help build and rebuild young manhood; men who are not afraid of work, for the CCC camp is no place for an adviser unless he is virile, dynamic, and alert. No educational activity is haphazard. This District requires that every course be outlined. The building of many of the courses is done by committees appointed by the District Educational Adviser. The camp advisers are living with the direct educational problem of their respective camps and the policy of the district is to give them the opportunity to make contributions from their own knowledge gained by experience. Courses are conducted on a quarterly basis and subjects are organized in units, each unit containing from ten to twelve lessons. In order to stimulate interest and pride of achievement, certificates are issued enrollees who successfully finish the required number of units. The subjects taught in camps are not arbitrarily chosen by the Adviser. They are selected as a result of the expressed need of the enrollee through personal interview. That is to say the school program is constructed largely by counseling and guidance. 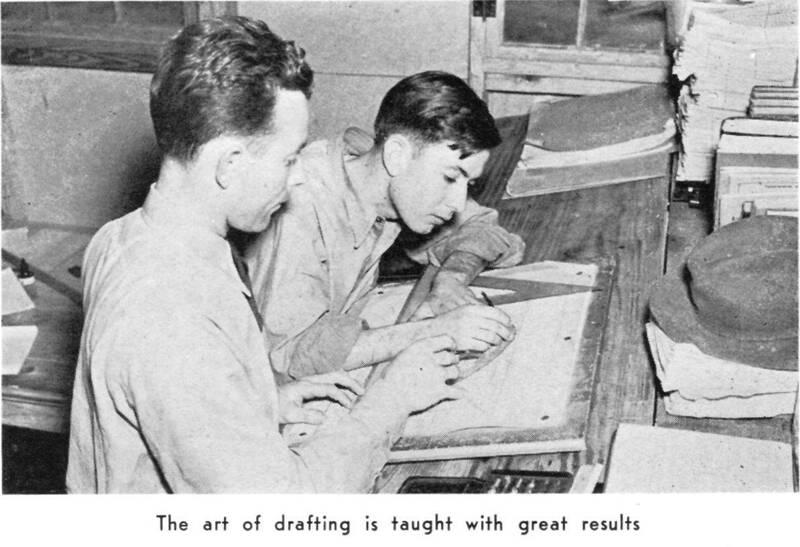 New men in the organization are contacted individually and when it becomes known just what their educational background is and where their direct interests are they are encouraged to commit themselves to a regimen of training that will fit their needs, then classes are organized for this purpose. The greater the care in the training of advisers the better will be the service to the enrollees. CCC enrollees are assured that their educational advisers are not only capable and progressive educators, but well informed as to the many fields of human endeavor, particularly the fields of industry, labor, current social conditions, and psychological science. The Educational Advisers are called upon to counsel in all these fields: he must be able to give expert advice and opinion in all. 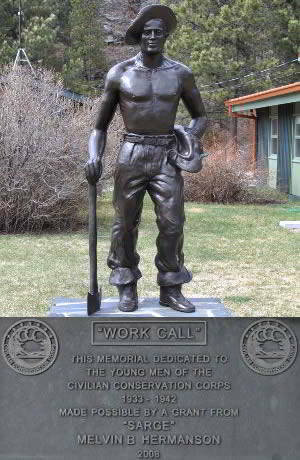 The CCC exists for the benefit of the young men enrolled and every care is taken to train them how to intelligently plan and perform a job of work. In order to further this objective instruction is given on the job by the members of the technical staff in each of the camps and related subjects are taught in the camp school. 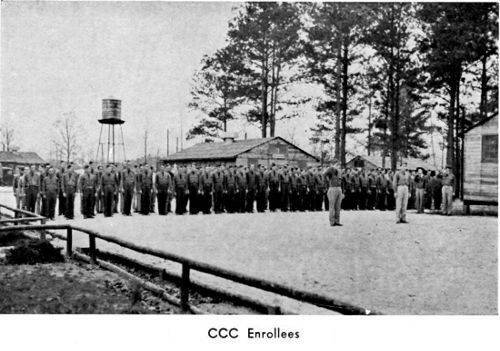 An acute problem that faces the young men in the CCC is to get a job when their term of service is completed. This problem is aggravated by isolation of the enrollees and the consequent difficulty of contacting employers. But a great deal has been done to help in this matter. With the cooperation of the National and State Employment Services, interviewers are sent from the district employment offices to interview the best trained men and get their applications on file. A follow-up system helps keep these applications alive and at stated intervals additional men are interviewed. The individual camp authorities are not only cooperating in this activity, but through their vocational guidance and training and through many social and recreational activities attempts to develop an enrollee who is aware of himself and the world about him and the possibilities that lie before him. The CCC seeks to develop initiative, love of country and obedience to its laws, honesty and character. All this constitutes the philosophy of the educational program. The events and activities mentioned in this brief history are by no means to be taken as a complete index to operations of the Nebraska-South Dakota District, CCC, during the past four years. No attempts have been made to offer a record of all that has happened. Such a record if ever written will fill for these four years alone a number of volumes comparable to a complete history of a major war; in many respects our duties and actions have been as numerous and far-reaching as those performed during such a period of storm and stress. In retrospect we may be proud that the Nebraska-South Dakota District is second to none in the good that it has accomplished, not only for the thousands of young men who have been under its influence but for their families and for the general public.